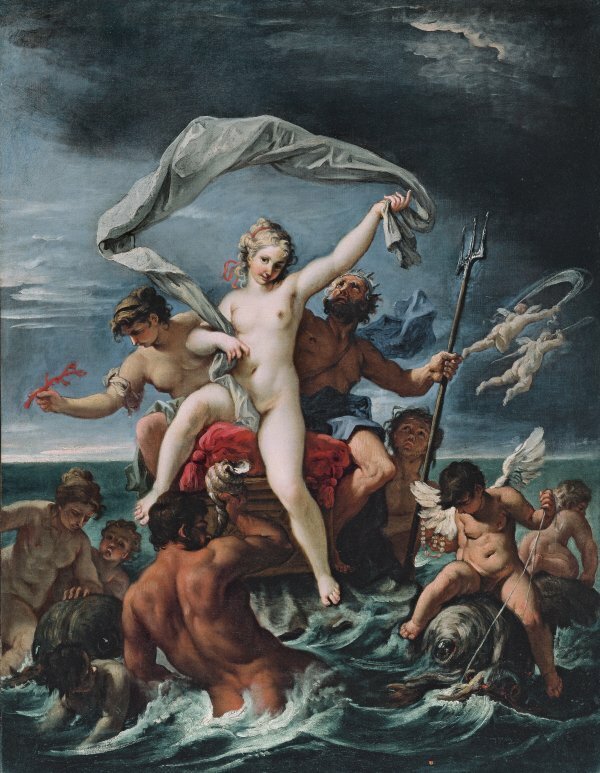 The present pair of canvases depicts the weddings of Neptune, god of the sea, and Bacchus, god of wine. They can be dated to the early 1690s during the time Ricci was in Rome. Among his most important works of this period is the fresco commissioned by the Colonna family for the Sala degli Scrini of their palace, depicting The Glory of Marcantonio II Colonna. During the four years that Ricci spent in Rome before his departure for Lombardy in 1694 he focused most intensively on mythological subjects. The earlier history of this pair of canvases is only known from the 20th century onwards. Both were in the Suida Manning collection in New York, from where they passed into the ownership of the dealer Silvano Lodi in Campione d’Italia, and were acquired from him in 1982 for the Thyssen-Bornemisza collection. The paintings were first published in the 1986 catalogue of the Collection by Gertrude Borghero and from that date onwards appeared in successive editions of that publication. The canvas of Bacchus and Ariadne depicts the celebration that takes place after the god’s marriage. Ariadne, daughter of King Minos of Crete, was in love with Theseus, whom she had helped to escape from the labyrinth with the help of the famous thread. Eventually, however, Theseus abandoned her on the island of Naxos. According to Ovid in his account of the story in the Metamorphoses, the grief-stricken Ariadne was consoled by Bacchus who asked her to become his bride. In addition, the god sent up to heaven a crown that he had given Ariadne, the pearls of which became the stars of a new constellation between the Dragon and the Serpent. Among their retinue in the present composition Ricci includes the tiger and panther that traditionally pulled Bacchus’ chariot, depicted reclining on the left. The principal figures are peacefully seated, slightly offset to the left, while a female satyr fills Ariadne’s cup with wine and a young woman sets a nuptial crown on her head. The figures depicted in this celebration are all traditionally associated with Bacchus, including the putti in the foreground and the wild looking satyrs such as the one playing the tambourine in the foreground. The other canvas of Neptune and Amphitrite takes place at sea, while Neptune is also depicted in the traditional manner as an old man. Amphitrite was a nereid or sea nymph and one of the daughters of Nereus. She initially rejected Neptune’s proposal of marriage and concealed herself from him in order to avoid his attentions. Neptune, however, sent a number of dolphins to find her and convince her to accept his proposal, and their successful mission was rewarded with a constellation of stars. Ricci organizes the composition through the compact central group in which the nymph and the god are located on a throne that rises up from the waves above the figures surrounding it, including putti, water nymphs, fantastical sea creatures and a triton blowing a conch. Amphitrite holds up a billowing length of cloth that is a traditional attribute of classical sea goddesses. Ricci’s two, carefully constructed compositions are painted with lively colouring and a striking range of chromatic nuances. The tonalities used for the main figures in both works highlight their contrasting flesh tones, which become the most important visual elements. Their bodies are modelled with rounded, luminous forms and a high degree of finish, standing out from the more red and earthy tones of the other figures. Both canvases have been compared to other compositions by Ricci: Bacchus and Ariadne has been compared to a Bacchanal previously in a private collection in Berlin in which the figures are comparable, while Neptune and Amphitrite has been related to a canvas on the same subject in the Wax collection in Genoa. It has also been compared to the composition of the same subject by Annibale Carracci in the Galleria Farnese, Rome.